From factory to front door! 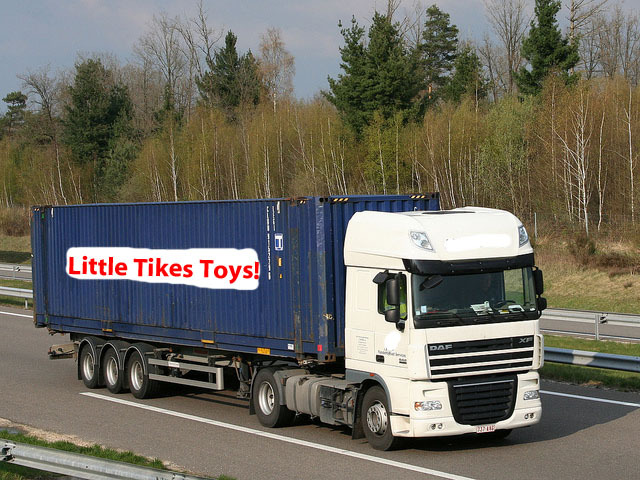 We have just received another container load of Little Tikes toys in to our warehouse so we now have good stock of most Little Tikes products ready for dispatch direct to our customers all over the UK. Unlike many toys these days, the majority of Little Tikes toys are not manufactured in China. 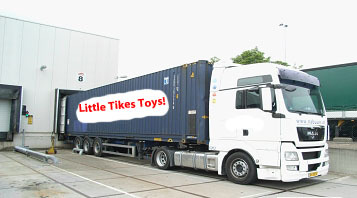 We receive regular deliveries of Little Tikes toys in 45′ shipping containers which come direct from the Little Tikes factory in Poland and we thought it would be interesting to give a quick summary of the journey that your Little Tikes products have been on to get to your door and ready for playtime! Click here to see all the Little Tikes toys we are selling and what great prices we are offering at the moment! But hurry, they are selling fast as Spring is on it’s way at last! They are loaded at the Little Tikes factory in to large steel container boxes and taken by road to a port in Poland where they are loaded on to a large container ship and sailed to a UK port ready for the next leg of it’s journey. Once the ship has docked the containers are lifted off with a large crane and attached to a lorry which then drives the container of Little Tikes toys by road to our warehouse. … to the customer’s house either in their car or one of our vans or by courier! So, there it is – when your Little Tikes toys arrive at your door you will know where they have come from – quite nice to know when the news is full of mysterious tales of the contents of our processed foods! As we receive regular container deliveries, we manage to maintain good stock levels through most of the year. Unlike many of our competitors, we prefer to hold the stock in our warehouse so we can offer a fast and reliable delivery service rather than rely on the Little Tikes home delivery service which, in our experience, is a bit hit and miss and regularly encounters delays, damages and delivery problems. So, when you order from us you can be sure that you will get the goods when you want them and without unexpected problems. However, if the product you are after is out of stock our website will tell you how long to wait until it is back in stock. You can then pre-order and reserve your product and we will send it straight to you when it comes in to stock. Also, if there is a particular Little Tikes toy you are after and can’t see it on our website contact us and we will do our best to get one for you! Click here to go to our website and see our full range of playhouses, swings, climbing frames, trampolines, sandpits, slides and much more…! Or see our contact us page and you can even speak to a real person on 01635 248683!